The Wilkeson Coke Ovens represent an early industrial activity in Pierce County and the State of Washington which had an effect throughout the Northwest. They are examples of the influence of the railroad in the development of the area and one of few symbols left in the county of a once thriving coal industry. The Wilkeson mines played an important role in the maintaining the economic viability of the Northern Pacific Railroad in Pierce County during the late 1870s. The presence of coal in the county apparently was known as early as 1862 or 1863 and designated as the “Puyallup River Coal Field”. (1) Not until 1868 did coal samples surface from the hills above South Prairie. In Tacoma, fine examples of bituminous coal were shown from a trip conducted by Morton Mathew McCarver, one of the founders of Tacoma. “The coal “burns freely, can be lit with a candle, makes no clinkers, and leaves an ash as white as that of wood….”(2) . During the fall of 1874 and summer of 1875 many explorers confirmed the discoveries and numerous claims were made under the Coal Land Law of March 3, 1873. (3) At this time, the Northern Pacific Railroad (NP) had just finished their line from Kalama to Tacoma. NP officials saw this as an opportunity not only to supply the railroad with local coal, but to satisfy investors who were threatening to pull out and leave the pending Transcontinental project in jeopardy. NP had the right to claim every other section of land for the transcendental route and NP took advantage of this law to stake claims. NP officials temporarily rerouted the transcontinental line to do stack claims to the mines in Wilkeson. By 1877 a rail line was completed and the destination named after the Samuel Wilkeson who was serving as the Secretary of NP at the time, and earlier was their surveyor of the region. Both Chinese and Caucasian labor were employed in the rail construction and later mining operations. (4) Mines were named after investors such as the Ainsworth and Wright, early founders of Tacoma. 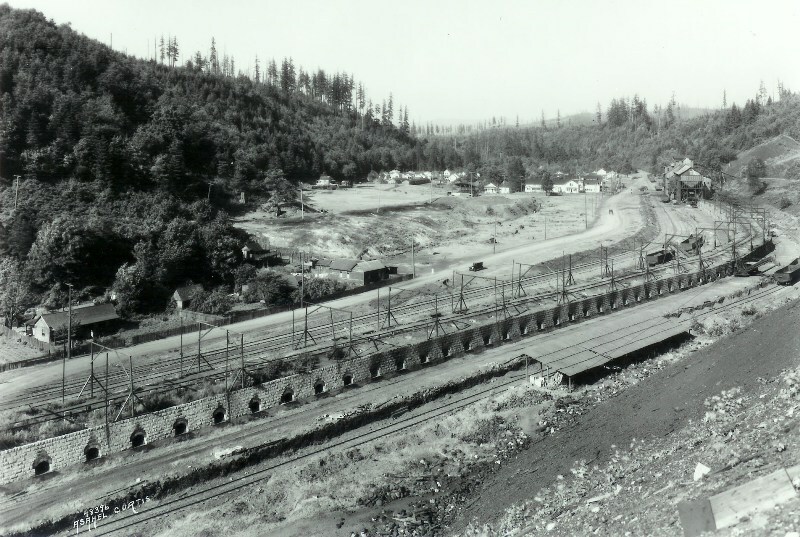 These mines were located in what was to be a company owned area or “Uptown” Wilkeson, while downtown Wilkeson was private homes and businesses. The Tacoma Coal and Coke Company was the first to produce coke in Uptown Wilkeson in 1884. The highly prized, bituminous coal found in Wilkeson, burns hotter after the coking process, and is more stable for firing in industrial furnaces of the time. An experimental row of pit ovens were built and 400 tons of coke was produced from 700 tons of coal. (5) This first coke was used in Tacoma and in Portland, Oregon. Early accounts do not discuss where this first site of the pit ovens stood. In 1885, two beehive designed ovens were built and by 1886 nine more were added and another 21 started. 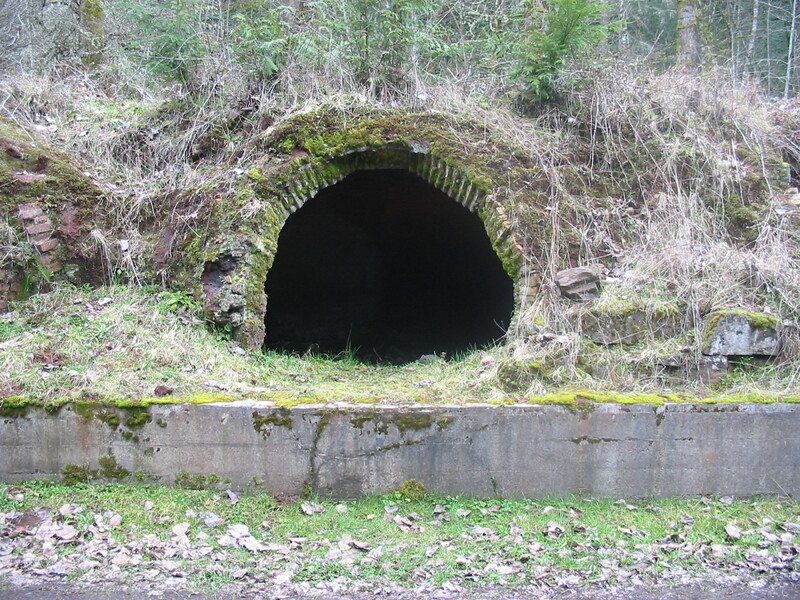 This earlier row of beehive ovens was abandoned in 1898 and now lies buried in an undisclosed site farther north of the current Wilkeson Coke Oven Park. At the current park site, Tacoma Coal and Coke then built another 30 ovens in 1887 and again in 1891, 80 more ovens were built. (7) In 1917 Wilkeson Coal and Coke Company added 60 more ovens. The final construction was the result of the enormous demand for coke during World War I. This would be the final number – a “battery of 160 ovens of Wilkeson Coal and Coke Co.” was the title under a photo showing in the edition of the Wilkeson Record published in 1917. Reportly, there were 459 ovens in the State at the close of 1919. (8) This included coke ovens in nearby places like South Willis (using Wilkeson coal), Farifax, Montezuema, Carbondado, Crocker, and Snoqualmie. Today the other locations are either on private land, have been completely removed and/or in worse condition than Wilkeson’s ovens. The Town of Wilkeson had a reported 3000 population in the town’s heyday. Today the mines are sealed. The rows of company owned homes, the huge coal bunker, mine offices, the men’s dormitory, the hotel and stores are gone. Uptown Wilkeson is no more. Besides the bunker cement frame, only the remaining beehive coke ovens in Wilkeson are left to remind us of the early struggles of the Northern Pacific Railroad, the impact of Wilkeson’s coking coal on the region’s industries, and the thousands of immigrants who worked in Wilkeson’s mines. Daniels, Joseph. 1963, Mining history of Pierce County, Washington, 1860-1962, page 10. Prosch, Thomas. McCarver and Tacoma, letter dated September 8, 1868. Arsanto, Pete. 1947. History of Wilkeson, Pierce County, Washington. Pg 3. Daniels, Joseph. 1920. The Coking Industry of the Pacific Northwest, pg 10. Daniels, Joseph. 1914. The Coal Fields of Pierce County, pg 64. Interveiw with Robert Peloli, miner and Wilkeson resdient, 2002.